It was a full class and I’d brought somebody along for a taster session who clearly couldn’t start with Angie, so he got to do an alternate WOD outside the box. Fortunately it was a gorgeous morning. There were too many of us to all get pull up bars at once, so Kat, Oni, Rob and I started out with push ups and finished with pull ups. That was, I have to say, utterly foul. The one good thing about Angie is that you get squats last – except this time we got pull ups last! 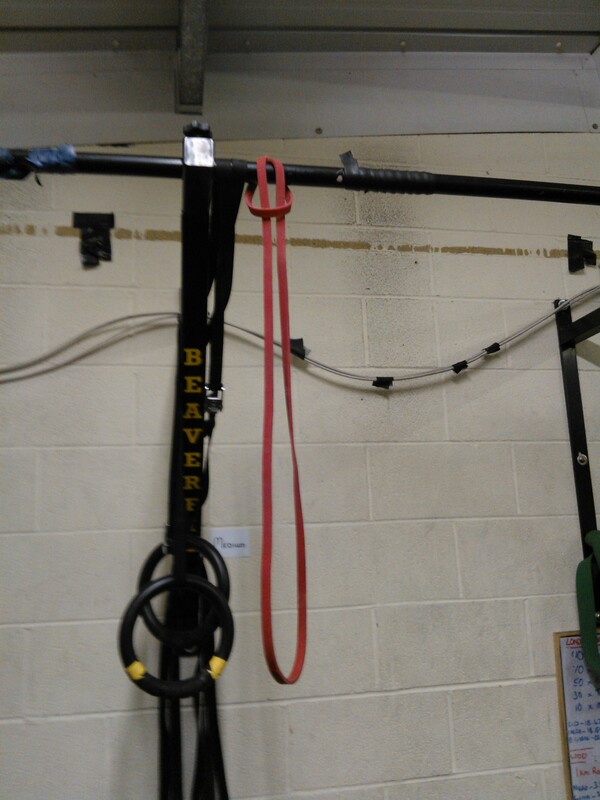 I took the Silver option, normal rounds but with a band for the pull ups (two bands, actually, one red, one purple, I’m not daft!) and finished in 21:51, a whole 4 minutes and 17 seconds faster than my previous time, and the previous time I was using a green band AND doing girl push ups from my knees! I’m very chuffed with my new pb. The 100 push up programme really had worked its magic, although I only got to 50 before I had to stop the programme because of (unrelated) injury. I did the push ups in tens and didn’t have to stop for more than a single breath and a quick shake of the arms throughout the hundred, and didn’t stop at all in my sit ups. One little break in my squats, to reset my position and then working in tens for the pull ups – as a result, I got a time I feel really good about. The lift was single leg deadlifts – very tough. The only notable thing for me about the WOD was that I decided to try jumps again, using two stacked 15k plates. It was horrendously difficult and I struggled to keep going because I was constantly having to override what my synapses were telling me so that I could continue the movement. But I did it. It didn’t feel at all good, but maybe if I keep trying, I’ll get to the point where it becomes easier again. •	PB – oh yes! Burpee challenge day 29. Still going. 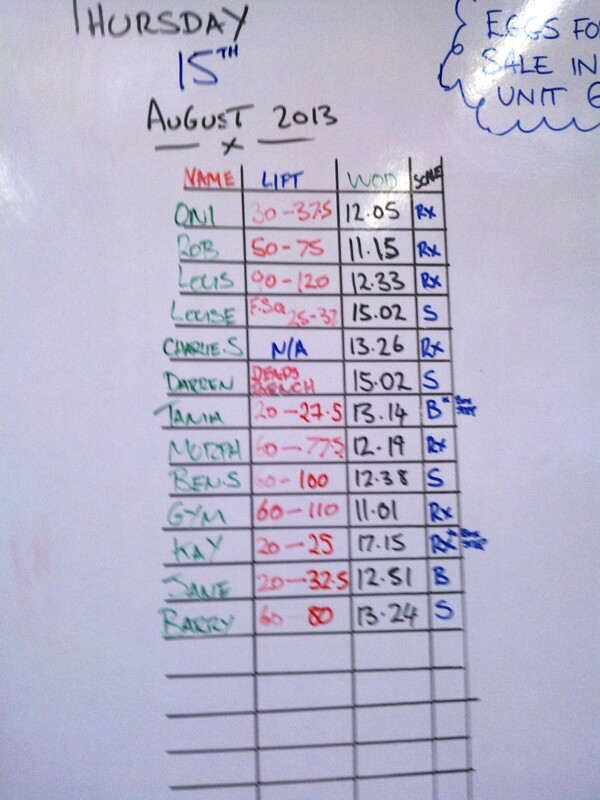 Posted in benchmark girl wods, proprioception, pull ups, Why I do Crossfit, WOD and tagged "Angie". Bookmark the permalink. And other Carrollisms for those who like them (callooh callay! are the ones that spring to mind) and for those who don’t – tough. If you don’t know what I’m talking about, I don’t really care, you can Google it. 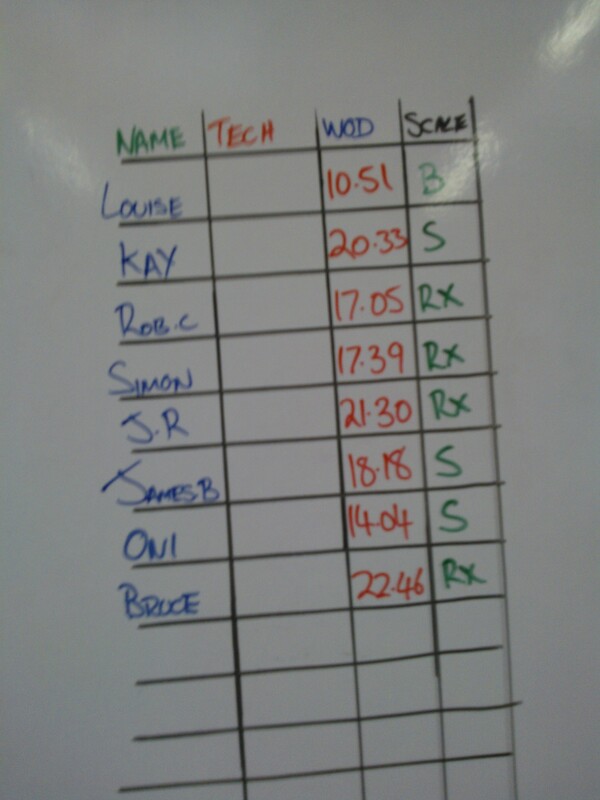 So yesterday I RX’d the WOD (sort of) and didn’t die (but felt like I had). 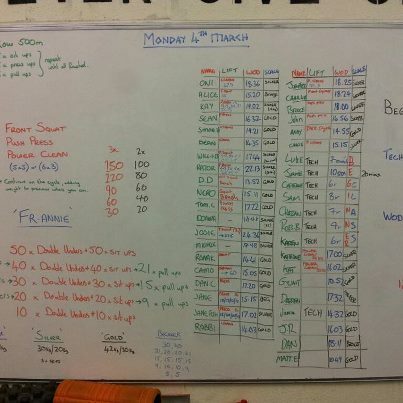 It’s one of those Benchmark WODs – other workouts in my diary. The bit I didn’t RX was box jumps. I really don’t know if I will ever be able to do box jumps again. I did box step ups, and apparently that counts. It took for-flaming-ever! 17 minutes and 15 seconds to be precise. I hated every single second. But I did it. I weigh 52 kilos. I really really know exactly how much I weigh! So … that was tough. 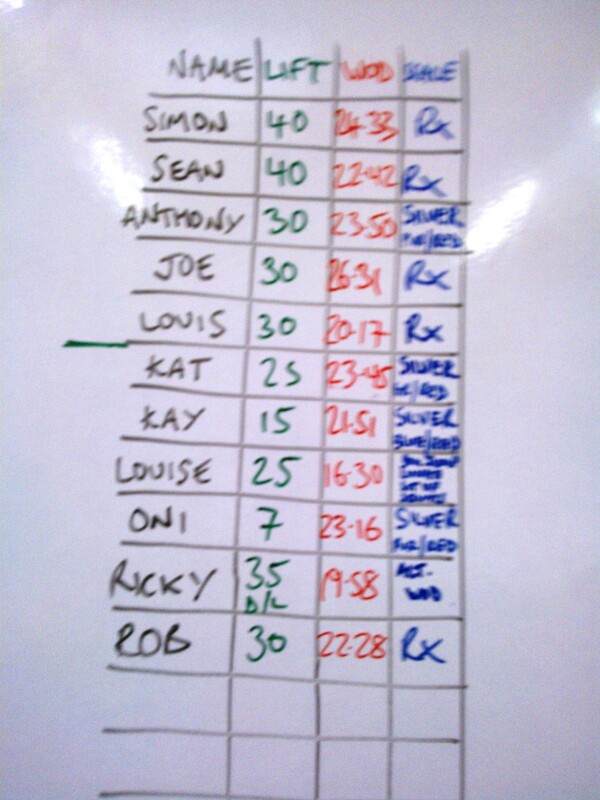 Today was even tougher, as it’s day 16 of the 100 day burpee challenge and every damn one of those sixteen burpees hurt! 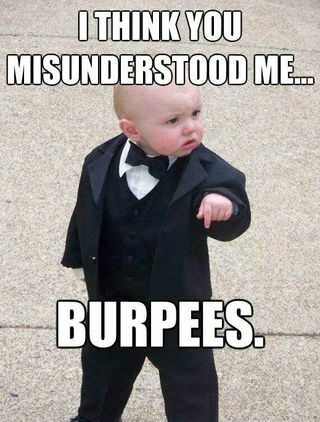 Mental toughness and all that aside, it’s excruciating to burpee when you’re all DOMS. But I’m happy – I can see I’m making progress. Posted in benchmark girl wods, Crossfit women, Running, Why I do Crossfit, WOD and tagged Christine on the run. Bookmark the permalink. I couldn’t have guessed it would be GI Jane With Balls that renewed my confidence, but it was. Before the WOD we had tech practice on handstands, handstand push-ups or walking handstands. This didn’t strike me as a likely scenario, but after some one-on-one coaching from Barney, I found I could actually kick up into a headstand against the wall, using abmats as a support for my head, and once up there I could stay balanced for a good long time without any support. That was a surprise! Although, on reflection, it shouldn’t really be much more difficult for me to balance on my hands than on my feet, as the level of proprioception is about the same. 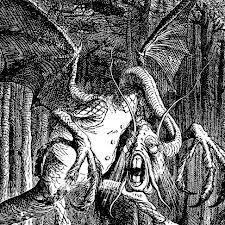 The swollen blood vessels in my eyes are a surprise though – I didn’t think I’d been inverted anywhere near long enough for that to happen. The WOD – nicely named GI Jane With Balls is100 ball-slam burpee pull-ups for time. Nasty! Gold was 9/7 kilo medicine balls. Not possible for those who don’t have a strict pull-up of course. Silver scale was the same medicine balls but jumping pull-ups from a box. Bronze was as silver but no pull-ups at all. I decided to try silver, although I had no great hope of it, so I took a 3 kilo ball and put it beside my box so I could scale part way through if I had to. It was a hot and horrible exercise in grit and willpower – and also a test of basic maths under pressure. Somewhere between 60 and 50 reps I forgot to rub off the whiteboard mark to show I’d completed a round of ten, so I decided to go for twenty reps and then erase two marks. When I’d finished I thought about it and now I think I miscounted and only did 19. So I’m pretty sure my time is for 99 reps, not 100. Somewhere around 77 I decided it would be nice to scale, but I couldn’t find my 3k ball in my peripheral vision. Then I remembered Barney striding over to yell at me to keep my spine straight in the ball slams and of course he’d taken my baby ball away to stop me wimping out. So I finished the WOD with my original scale in 20:33 minutes. Not fast and not pretty, but done. Never in my wildest dreams did I believe I’d be able to do that – and in 20 and a half minutes too! •	Wishlist – today I’m happy with what I got! •	PB – well, even one headstand would have been a personal best so to get to balance for as long as I did, four or five times in a row, was rather exciting. 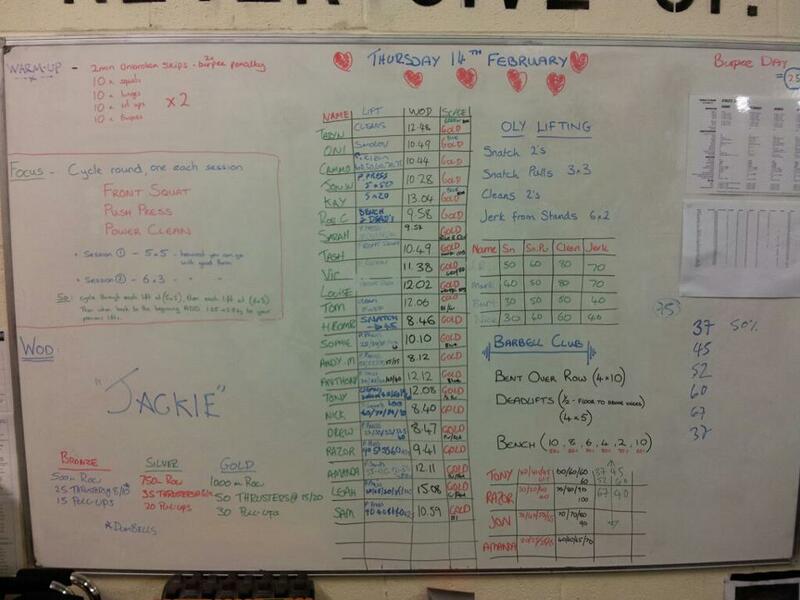 Today I love Crossfit – scarlet eyeballs and all. Posted in benchmark girl wods, crossfit exercises, proprioception, pull ups, Why I do Crossfit, WOD and tagged ball slams, burpees, GI Jane. Bookmark the permalink. 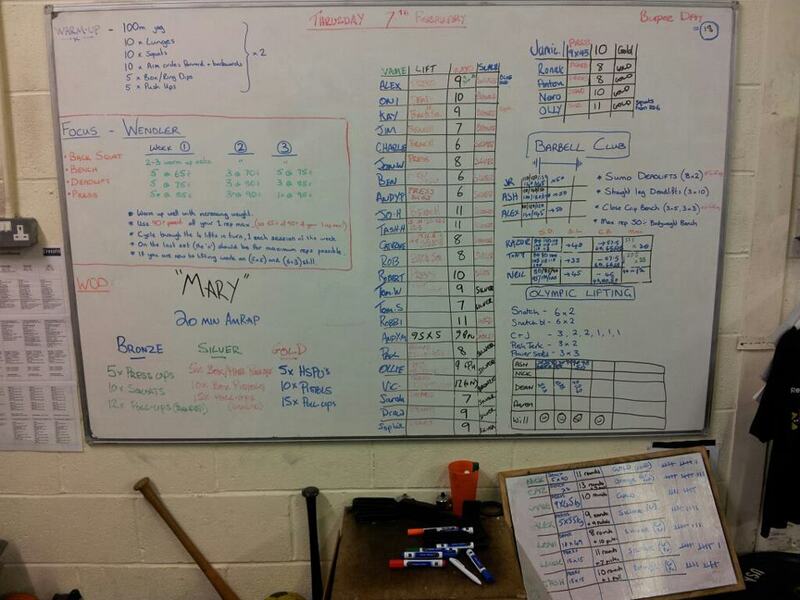 First time that Mary’s made an appearance at Reebok Crossfit Connect Hove apparently. I had no great expectations of this WOD, being mainly focused on the Open Gym straight after and that I’d committed to getting back onto a 12” box by the end of it, come what may. With that terrifying thought in my mind, I just didn’t think about the WOD at all until we were into it. As I can’t do pistols (well I can, after a fashion, but when my proprioception is bad, pistols are an insane thing to try and attempt) I was definitely going for bronze on this WOD. Bearing in mind my experience with the two bands on Monday, I tried a couple of pull ups with the purple band only – it was quite hard work but I decided I’d try and make the first couple of rounds with just the purple band and add in the red when it got too much for me to make good reps. But somehow I never did! 9 rounds on the purple band. I was down to singles on the pull ups by the last round, and I no repped myself twice when I didn’t think I’d got my chin over the bar, but I didn’t have to supplement with the red band at all. Once my arms and hands stopped shaking I felt like a superhero! Doesn’t that band look lonely? • PR – does going down a band count as a PR? • Wishlist – that I could relax about the box jumps (I jumped stacked plates and finally got to 7 box jumps on the 12” box but it took every bit of courage I had to do it). Posted in benchmark girl wods, proprioception, pull ups and tagged box jumps, crossfit, handstand press-ups, pistols, pull up programme, pull-ups, scaling WODs. Bookmark the permalink.